Open Carry in North Carolina seems to be a confusing topic for many people that I encounter in the world of #FirearmsSafetyTraining. I’m never surprised at the many students that drive to class with their firearm that don’t know the laws of Open Carry. North Carolina Open Carry law provides ONLY two options when transporting a handgun. Fully Visible, meaning in plain sight if approached by an officer. Recommended locations include the passenger seat or dashboard. As soon as the officer approaches the vehicle, immediately notify the officer that there is a handgun in the vehicle and where it is located. This protects both yourself and the law enforcement officer and keeps you both safe from an accidental firing of a handgun to fear for life. The second option requires locking the firearm in the dashboard, trunk, or gun case that is securely affixed to the vehicle. Pistol cases are sold with a cable that can be affixed to the seat post or other permanent fixture in a vehicle. There are a variety of pistol cases available and they vary in size and in style. If you are looking to purchase a pistol case, they are available locally in places like Walmart, Academy Sports, Gander World, Field & Stream and other retailers. You can only purchase pistol cases online saving quite a bit of money. It is EXTREMELY important to research firearm laws in every state that you will cross when traveling. Many assume that firearm laws are the same in every state but would be shocked to find that they differ greatly from one state to another regarding both open and concealed carry. If you are just starting your firearms training journey, the most important lessons to becoming a good shooter are the fundamentals of Marksmanship. 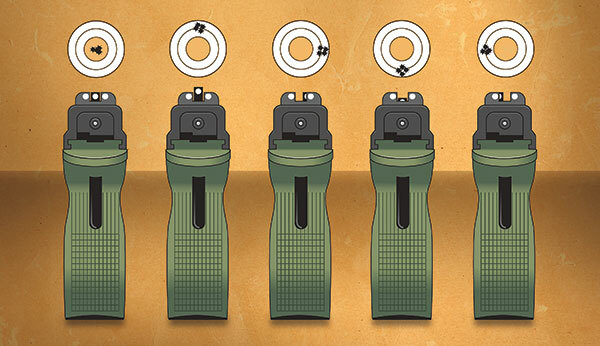 The fundamentals of Marksmanship include sight alignment and sight picture, stance, grip, trigger control, and proper breathing techniques. There are two rules for good sight alignment. First, be sure that the top of your front sight is level with the top with your rear sight. Second, when looking from the rear sight to the front sight, be sure that you have even space on the left and right side of the front sight. Sight picture is the relationship of your front sight to your target. When shooting, you focus on your front sight and not your target. Your front site will be clear and your target will be blurry. There are several stances, but the most common are the Isosceles stance and the Weaver stance. In the Isosceles stance, stand with your feet about shoulder-width apart and your knees slightly bent. Lean your body slightly forward. Raise your arms into your natural site of alignment. When in the proper position, your arms should form a complete triangle. Many people prefer a modified isosceles stance by placing the support foot back a little. With the Weaver stance, place your body in a boxer’s stance, strong side foot forward. The support foot is angled slightly behind the other. With your body in position, hold the strong-arm straight. The support arm will be bent at the elbow with your arm in a push-pull motion as your bring your firearm into your line of sight. Proper grip ensures that your hand forms a V formation high up on the backstrap. ALWAYS keep the index finger straight along the frame of the gun. NEVER put your finger on your trigger until you’re actually ready to take a shot. Next, wrap the three fingers of your strong hand around the grip. Take your support hand and wrap those fingers around your strong hand. Your thumbs must be stacked on top of one another with the strong hand thumb on top of your support hand thumb. 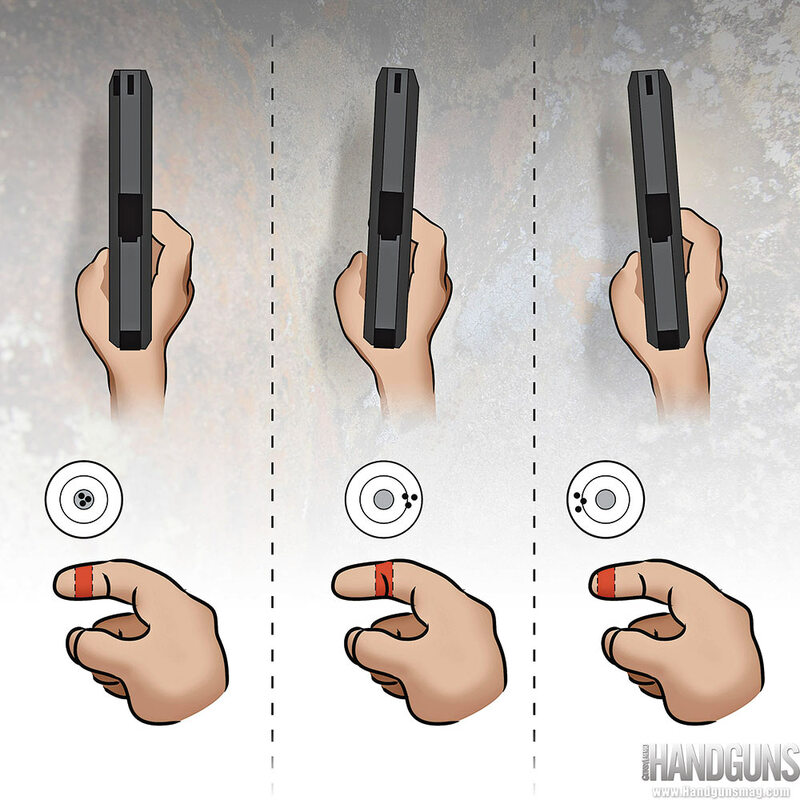 Trigger control consists of keeping the sights aligned while pulling the trigger. Do not utilize too much of the tip or the bend of the index finger. Instead, use the center pad of your index finger when taking a shot. Use a smooth even pull back when pressing the trigger and not jerky rapid movements. Ensure that each shot is taken at a consistent pace. When we talk about breath control you need to remember that as you breathe in and out with your natural breath, it will cause your firearm to move up and down. To maintain a steady shot, you should take in a breath, release half of the breath, take your shot, and release the remaining breath. New Shooters have a tendency to take a shot, look at their target then take the next shot. This not only breaks stance but breaks grip and sight alignment as well. 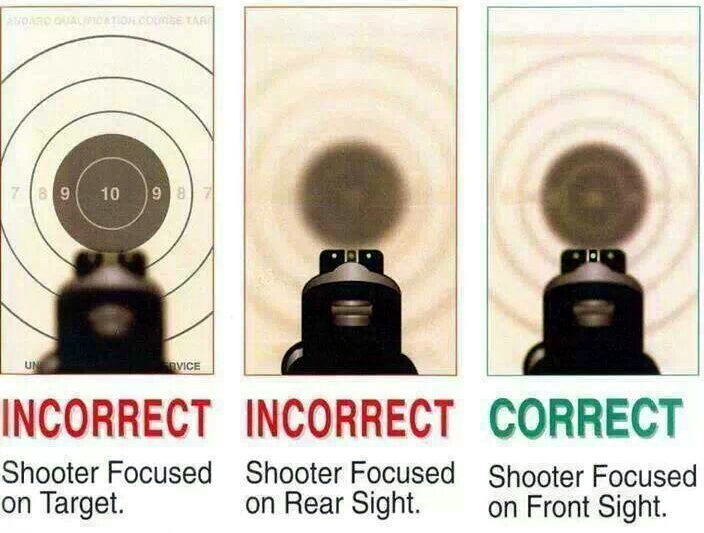 Remember, sight picture is focusing on the front sight and not on the target. Firearms training is a continued journey. Mastery of techniques comes with skills development. Skills development comes with practice! 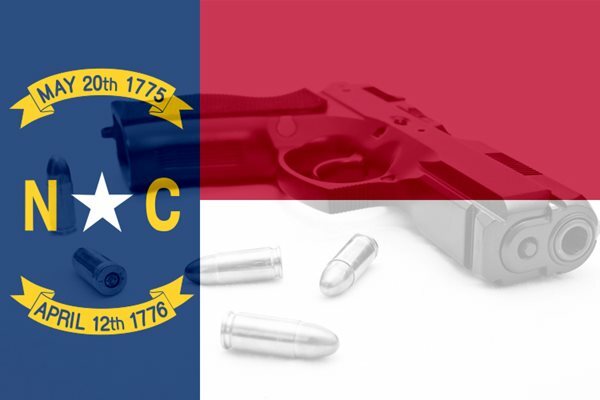 Obtaining a concealed carry handgun permit in North Carolina is a fairly stringent process. 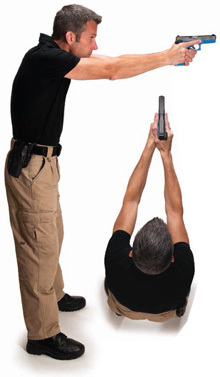 You must first take an 8-hour handgun certification course approved by the North Carolina Justice Academy. In addition, an on-range shooting qualification firing 10 rounds at 3, 5, 7 yards for a total of 30 rounds. A certificate showing that you have completed an 8-hour course is required at the time that you apply for your concealed carry handgun permit. You must submit your application in the county in which you reside. Due to long wait times in larger counties, I recommended that you set your appointment at your local Sheriff’s department as soon as your class is scheduled. Many local sheriff’s departments allow you to walk in to apply for your state issued concealed carry handgun permit while other Sheriff’s departments require that you set up an appointment online. In Forsyth county, it takes three months to obtain an appointment to submit your application. In Guilford county, it takes two and a half months to obtain an appointment to submit your application. Guilford County allows you to download the application and bring it to the Sheriff’s department while Forsyth County requires that you complete the application on site. On average, it takes up to 90 days after submitting your application to receive your state-issued permit. Wait times can be longer depending on how many are in the queue. This can result in a total time of attaining your state-issued concealed carry handgun permit of six months at a minimum depending on the wait time in your County? Click here to view the requirements of Piedmont Triad counties. We want to know, what County do you reside in, does your county require an appointment, and how long was the process? 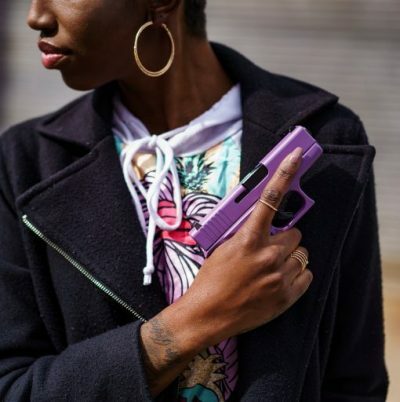 Author GIRLZ on F.I.R.E.Posted on Categories Concealed Carry, Gun RightsTags Certification8 Comments on ​How long Does it Take to Obtain a Concealed Carry Handgun Permit in North Carolina? With so many concealed carry options available, how do you determine which option is right for you? Most gun owners will tell you that they own many carry options based on their daily activities. They will also tell you that many that they tried are stuffed in a drawer to one day be sold on eBay.com. Curves of a woman’s body make it even more challenging to find the perfect concealed carry option depending on the firearms that she chooses for everyday carry. The options are limitless as women’s interest in firearms for self-defense and sport continues to soar. An inside the waistband holster is by far the most convenient for women on the move. There are numerous inside the waistband holsters available but when thinking about concealed carry, you want to choose a holster that is comfortable enough to wear all day. The Crossbreed Minituck is one of my favorites when used for appendix carry. No matter which brand you choose, make sure that the backing (the side that touches the body is flexible for maximum comfort. 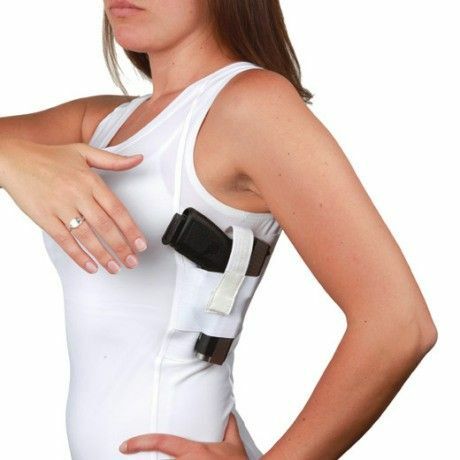 Belly Bands holsters are another great option for those who like to conceal carry close to the body. Belly Bands are practically invisible under the right garment and come in a variety of pricing options. Most belly bands have a place to house multiple handguns, extra magazines, a smartphone, flashlight, knife, and other personal items! The most beautiful and most popular corset holster for women is by far, the Dene Adams Brand. The Dene Adams corset holster comes with a universal trigger guard that secures your handgun firmly into place and works for those who are right or left handed and those whose prefer to carry in a cross draw position. The Dene Adams corset holster retails for $109 for the classic edition and $139 for the limited edition. Garter holsters are a perfect option for summer fun and Sundays. Both Femme Fatale and Can Can offer beautiful garter holsters that are perfect when you want to wear a dress or skirt. The Femme Fatale holster comes in a lace design while the Can Can garter holster comes in micro, classic, and shebang sizes. Another great option for women is the Femme Fatale Ankle SoxXx holster. The Femme Fatale Ankle SoxXx holster has a 5″ wide pocket that holds your handgun. The pocket is designed to hold a variety of handguns allowing your handgun to be positioned to the contour of your leg allowing for total concealment. There is a plastic shield that is hidden between the ankle and the handgun for added comfort. UnderTech Undercover makes women’s Concealment Short Shorts. The are perfect for wearing with skirts, jeans, and slacks when you don’t want to wear a belt. Dene Adams now make the body shaping Thigh Holster Shorts that smooth the tummy and conceals your handgun with a built-in trigger guard and a breakaway retention tab. 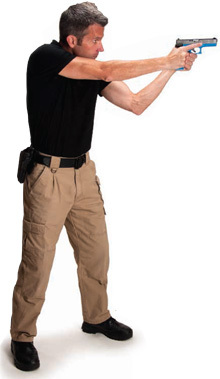 UnderTech UnderCover Concealment tank is designed to carry the handgun close to the body. It has a holster pocket on the left and right side and is perfect for those that prefer to cross draw their handgun. You could also one pocket for extra magazines. No matter which option you choose, always make sure that your trigger guard is completely covered for maximum safety. Get Over your Fear of Handguns – May Did! Although she was raised around handguns, during May’s class introduction she told us that both her dad and her brothers owned handguns, shotguns, and rifles. Still, May remained terribly afraid of handguns. May recently decided that the thought of owning a handgun was not a bad idea. She admitted she had recently visited a local store to browse the handgun section and even thought she might like to own a revolver. Safety is the beginning of any good class but when we got to the actual handgun portion of the class, the first thing I did for May was introduce her to the rubber training handgun. To my surprise, she immediately started shaking, confirming her fear. I tried to remove the rubber handgun from her hands but she was determined to shed her fear, and held on. I told May and all of the students present that the most important thing to remember is that a handgun is a tool. A tool cannot function without human interaction. We must remember that fear is based on conditioning, which is a learned behavior and can be reinforced through thought and memory of past experiences. When we identify our fears, we immediately have a chance of overcoming them. It turned out that May’s fear was conditioning. With May’s fear, came respect for the tool. We should all have a certain amount of fear of firearms less we become too comfortable, sacrificing our safety and those in our presence. As it turns out, May having both fear and respect for firearms, payed off in her favor. 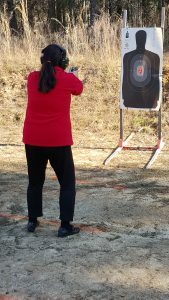 She was the best shooter of the day during the required North Carolina Concealed Carry Handgun qualification requirement. After completing her concealed carry qualification, May admitted that she still felt some anxiety, but was much more comfortable with the thought of purchasing and owning her own handgun, which she never would have considered before. I tell all of my students that Concealed Carry, if your first class, should be considered a first step in your firearms training journey. With continued training comes the ability to utilize your tool with safety, precision and accuracy, if needed, which we all hope never happens. Author GIRLZ on F.I.R.E.Posted on Format ImageCategories Gun Safety, TrainingTags Certification2 Comments on Get Over your Fear of Handguns – May Did!